Convenient foil pack holds one Wine B'Gone Travel Wipe and still has the advanced fast-acting formula. Even better than the original Wine B' Gone customers hail as "the best on the market." Advanced surface-active agents remove wine stains faster and safer than ever from clothing, upholstery, carpets, sinks, countertops... just about anything. Removes coffee and many other stains, too! Featured in Good Housekeeping's 3 Top Red Wine Stain Removers! Now in a handy travel wipe! 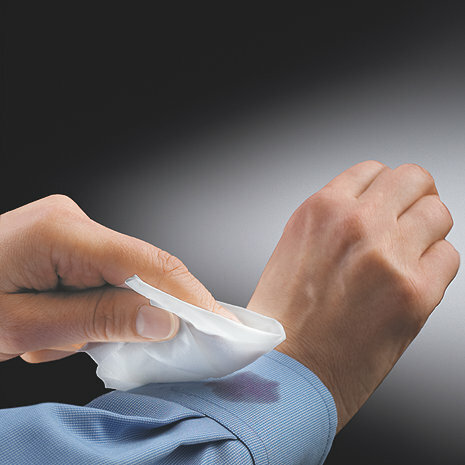 Now in case of an wine stain emergency, Wine B'Gone Travel Wipes are ready when you need them. Convenient foil pack holds one Wine B'Gone Travel Wipe and still has the advanced fast-acting formula. Even better than the original Wine B' Gone customers hail as "the best on the market." Advanced surface-active agents remove wine stains faster and safer than ever from clothing, upholstery, carpets, sinks, countertops... just about anything. Removes coffee and many other stains, too! In addition to red and white wine stains, Wine B' Gone Ultra removes many other tough stains, even old ones, such as: beer, brandy, whisky, rum, cola, apple juice, coffee, tea, berries, most fruits, vegetables, sauces, balsamic vinegar, mustard, ketchup, grass, hair dye, iodine, blood, medicinal stains, and perspiration stains. Wine B' Gone Ultra works on colorfast washable fabrics; upholstery; carpets; furniture; laundry; stainless steel; platinum, gold, silver, and diamond jewelry; sinks; plastic items; cabinets; countertops; glassware; and hands. The travel wipes just came in yesterday and came in handy right off the bat. Coffee came right out of my work shirt and even red wine doesn't have a chance. Keep a couple in your car or bag for work and travel. Great Idea.